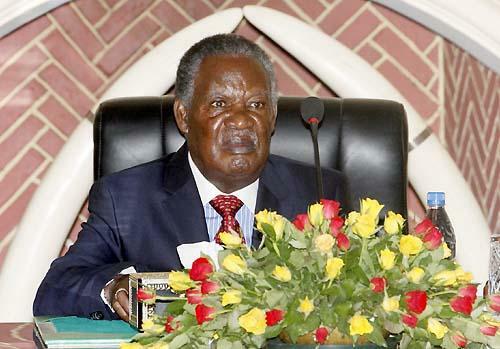 The President Michael Sata has again rewarded his relatives and close associates with appointments into diplomatic missions and ministerial positions. And Mr. Sata has accused UPND president Hakainde Hichilema of being a thief who the Commonwealth should come and investigate. Among those rewarded is newly appointed High Commission to Malaysia Miles Kaweche Banda who is first president Dr. Kaunda’s brother-law. Miles Kawecha Banda is young brother to late wife to Dr. Kenneth Kaunda, Mama Betty Kaunda, and is the one who gave one of the speeches during the funeral service of the former first lady. Sources at State House said Miles Nsampa, Sata’s nephew and finance Deputy Minister is actually named after the newly appointed High Commissioner Miles Kaweche Banda. Mr Sata also swore in Zambia’s Ambassador to the People’s Republic of China Eva Fundafunda. Others sworn-in are Deputy Minister in the Office of the Vice President Davies Mwango and Deputy Minister of Transport, Works, Supply and Communications Malama Mwimba. The two are the only PF MPs who voted for the illegal ratification of Acting Chief Justice, Lombe Chibesakunda during the parliamentary select committee. The appointments now means the Office of the Vice-president has two deputies which is unprecedented since inception of multiparty democracy. He urged the two deputy ministers to ensure that the levels of unemployment in the country are reduced considering the resources that the country has. On Mr. Hichilema, Sata who today again distributed the same document he gave reporters not along ago claiming HH was a thief, said it was good that the opposition leader has invited the Commonwealth to come and justify how he (HH) stole the money he has. Mr. Sata says the invitation of the Commonwealth by the opposition to probe his government’s alleged human rights violations will be an opportunity for opposition UPND leaders Hakainde Hichilema to explain to the Commonwealth the source of his wealth. Last week, Sata ordered all banks in the country to furnish him with account details of the UPND president, even without the court order. Last year, Mr. Sata distributed property details and accounts belonging to Mr. Hichilema to journalists at State House during one of his swearing-in ceremonies. Mr. Sata has been suing private citizens and newspapers that he feels defames him, even when he cannot be sued himself for defaming people because he enjoys immunity. The opposition parties recently petitioned the Commonwealth to come and see the PF government’s human rights abuses in Zambia.